These U.S. Armed Forces organizational colors for Corps,Groups,Brigades,Divisions, Departments and more. All flags are made in accordance with each service branch regulations and follow the Institute of Heraldry guidelines. They feature the finest quality fabric, flannel-lined pole hem heading with leather tabs and rayon fringe. We offer these flags in beautiful rayon fabric with full embroidery for indoor and ceremonial display or All weather nylon fabric with appliqued unit markings for indoor and outdoor use. 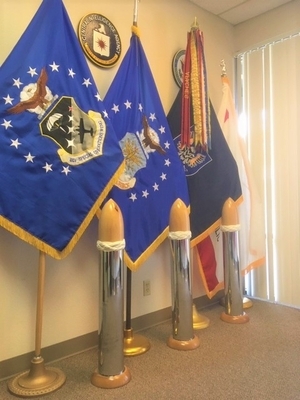 We currently are offering U.S. Army organizational and Marine Corps organizational flags but can also provide Navy, Coast Guard and Air Force ceremonial and unit flags. Please contact us to order.